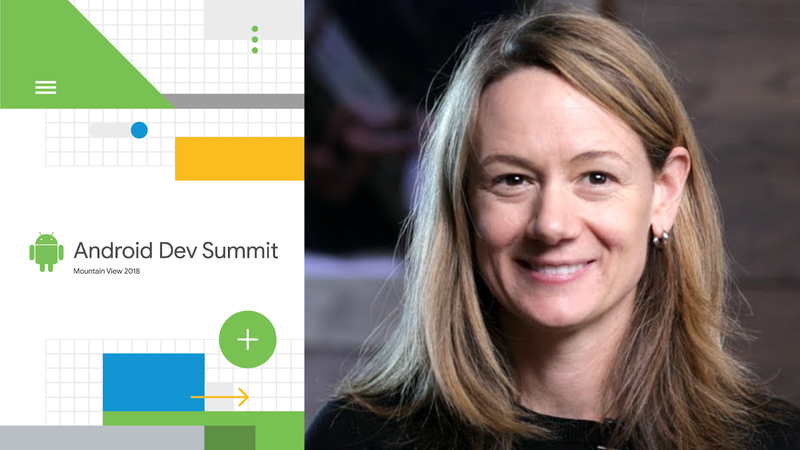 The summit kicks off on November 7 at 10AM PST with the keynote, where you'll hear directly from Dave Burke and others on the present and future of Android development. From there, we'll dive into two tracks (and two days!) of deep technical content from the Google engineering team, on topics such as Android Pie, Android Studio, Kotlin, Android Jetpack, Google Play and more. We'll also have demos and office hours for those attending in person; more on that in the coming weeks! We received a ton of interest from developers looking to attend in person; if you were one of those who expressed interest but didn't receive a ticket, we've already reached out to you and shared this news, but we want to apologize again that we weren't able to find you a spot. Rest assured, though, that we're still doing all that we can to free up more tickets, and we'll be reaching out to folks we're able to accommodate in the lead-up to the show. And if you did receive a ticket but your plans have changed and you're no longer able to attend, please let us know by sending an email to android-dev-summit@google.com, and we'll free up your spot for others on the waitlist. If you can't join in person, you can always join us online: we'll be livestreaming all of the sessions on the Android Dev Summit website and making them available on YouTube throughout the conference to watch at your own pace. Plus, we'll be sharing updates directly from the Computer History Museum to our social channels, so be sure to follow along! In less than a month, we'll be kicking off Android Dev Summit 2018, broadcasting live from the Computer History Museum in Mountain View, CA on November 7 and 8. We'll have two days of deep technical sessions from the Android engineering team, with over 30 sessions livestreamed. The first wave of sessions were just posted to the website: check them out and start planning. This week we released the first production-ready version of Oboe - a C++ library for building real-time audio apps. Oboe provides the lowest possible audio latency across the widest range of Android devices, as well as several other benefits. Oboe takes advantage of the improved performance and features of AAudio on Oreo MR1 (API 27+) whilst maintaining backward compatibility (using OpenSL ES) on API 16+. It's kind of like AndroidX for native audio. Check out the documentation, code samples and API reference. There's even a codelab which shows you how to build a rhythm-based game. If you have any issues, please file them here, we'd love to hear how you get on. Today marks the beginning of KotlinConf 2018 - the largest in-person gathering of the Kotlin community annually. 2018 has been a big year for Kotlin, as the language continues to gain adoption and earn the love of developers. In fact, 27% of the top 1000 Android apps on Google Play already use Kotlin. More importantly, Android developers are loving the language with over 97% satisfaction in our most recent survey. It's no surprise that Kotlin was voted as the #2 most-loved language in the 2018 StackOverflow survey. Google supports Kotlin as a first-class programming language for Android development. In the past 12 months, we have delivered a number of important improvements to the Kotlin developer experience. This includes the Kotlin-friendly SDK, Android KTX, new Lint checks and various Kotlin support improvements in Android Studio. We have also launched Kotlin support in our official documentation, new flagship samples in Kotlin, a new Kotlin Bootcamp Udacity course, #31DaysOfKotlin and other deep dive content. We are committed to continuing to improve the Kotlin developer experience. As the language continues to advance, more developers are discovering the benefits of Kotlin across the globe. Recently, we traveled to India and worked with local developers like Zomato to better understand how adopting Kotlin has benefited their Android development. Zomato is a leading restaurant search & discovery service that operates in 24 countries, with over 150 million monthly users. Kotlin helped Zomato reduce the number of lines of code in their app significantly, and it has also helped them find important defects in their app at compile time. You can watch their Kotlin adoption story in the video below. Android Developer Story: Zomato uses Kotlin to write safer, more concise code. 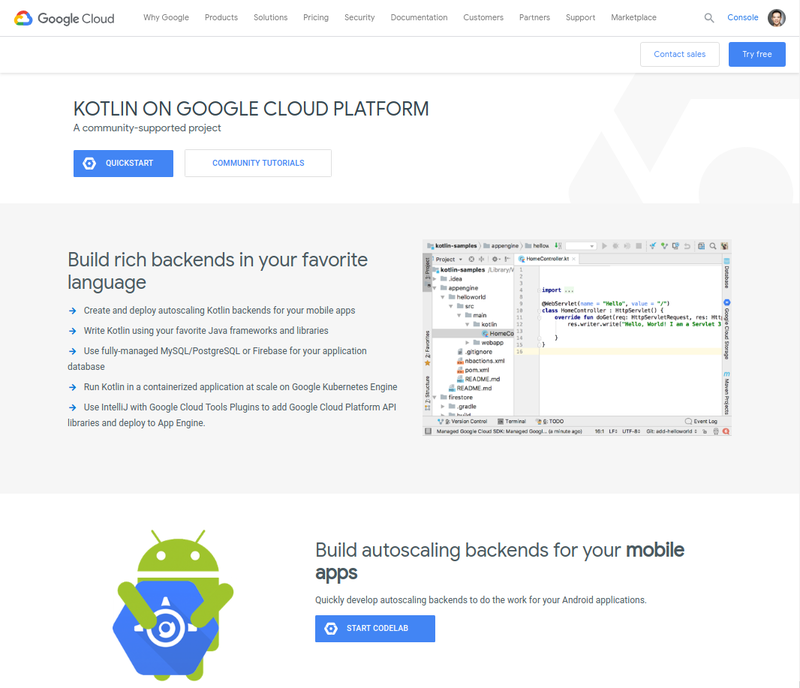 Going beyond Android, we are happy to announce that the Google Cloud Platform team is launching a dedicated Kotlin portal today. This will help developers more easily find resources related to Kotlin on Google Cloud. We want to make it as easy as possible for you to use Kotlin, whether it's on mobile or in the Cloud. Adopting a new language is a major decision for most companies, and you need to be confident that the language you choose will have a bright future. That's why Google has joined forces with JetBrains and established the Kotlin Foundation. The Foundation will ensure that Kotlin continues to advance rapidly, remain free and stay open. You can learn more about the Kotlin Foundation here. It's an exciting time to be a Kotlin developer. If you haven't tried Kotlin yet, we encourage you to join this growing global community. You can get started by visiting kotlinlang.org or the Android Developer Kotlin page. Today, Android Studio 3.2 is available for download. 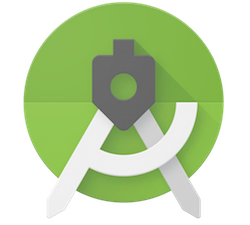 Android Studio 3.2 is the best way for app developers to cut into the latest Android 9 Pie release and build the new Android App bundle. Since announcing this update of Android Studio at Google I/O '18, we have refined and polished 20+ new features and focused our efforts on improving the quality for this stable release of Android Studio 3.2. Every developer should use Android Studio 3.2 to transition to using an Android App Bundle, the new app publishing format. 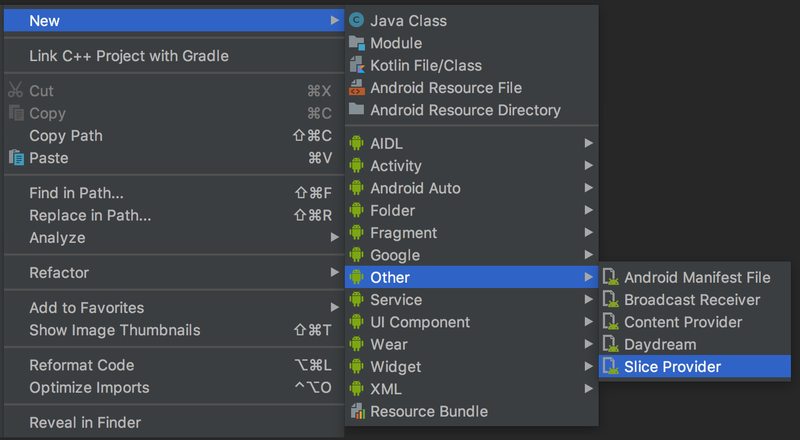 With very minimal work, you can generate an app bundle with Android Studio. Once you upload your app bundle to Google Play you can distribute smaller, optimized apps to your users. Early adopters have already seen between 11% - 64% in app size savings with app bundles over the legacy APK app size. Another feature you do not want to miss is the Energy Profiler. This new profiler gives you a set of tools that will help you diagnose and improve the energy impact of your app. Better device battery life is one of the top most user requests, and with the Energy Profiler in Android Studio 3.2, you can do your part in improving device battery life by making sure your app is using the right amount of energy at the right time. On top of these major features, there are 20 new features plus many under-the-hood quality refinements in Android Studio 3.2. By using Android Studio 3.2, you can also develop for the latest technologies ranging from Android Jetpack, to the latest in Google Artificial Intelligence (AI) APIs with Android Slices. Thank you to those who gave your early feedback on both the canary and beta releases. Your feedback helped us improve the quality and features in Android Studio 3.2. If you are ready for the next stable release, and want to use a new set of productivity features, Android Studio 3.2 is ready to download for you to get started. Below is a full list of new features in Android Studio 3.2, organized by key developer flows. Slices support - Slices is a new way to tap into the built-in Android AI capabilities by surfacing app content in Google Search suggestions and the Google Assistant. Android Studio 3.2 has a built-in template to help you extend your app with the new Slice Provider APIs as well as new lint checks to ensure that you're following best practices when constructing the slices. To use, right-click on a project folder, and navigate to New→ Other→ Slice Provider. Learn more. Sample Data - This feature allows you to use placeholder data to aid in the design of your app. This will help you visualize layouts that depend on runtime data. You can add built-in sample data to populate views such as RecyclerViews, ImageViews, and TextViews via a popup-window in the Layout Editor. Learn more. Material Design Update - When you start migrating from the Android Design support library to the new MaterialComponents app theme and library, Android Studio 3.2 will offer you access to new and updated widgets such as BottomAppBar, buttons, cards, text fields, new font styles and more. Learn more. CMakeList Editing Support - For those using C/C++ in their app, Android Studio has better support for CMake. With this release of Android Studio 3.2, code completion and syntax highlighting now works on common CMakeList build script commands. What's New Assistant - Android Studio 3.2 has a new assistant panel that opens automatically after an update to inform you about the latest changes to the IDE. You can also open the panel by navigating to Help → What's New in Android Studio. AndroidX Refactoring Support - One of the components of Android Jetpack is the introduction of the Android extension libraries (AndroidX) as a replacement for the Android Support Libraries. To add AndroidX to a new project you just need to add android.useAndroidX=true to your gradle.properties file. Additionally, Android Studio 3.2 has a new built-in refactoring action to help migrate your project the new namespace and dependencies. Also if you have any Maven dependencies that have not migrated to the AndroidX namespace, the Android Studio build system will automatically convert those project dependencies as well. Learn more. IntelliJ Platform Update - Android Studio 3.2 includes the IntelliJ 2018.1.6 platform release. This IntelliJ release adds many improvements to dataflow analysis, debugging, new inspections, inline external annotations, partial Git commits, plus much more. Learn more. Kotlin Update - Android Studio 3.2 bundles Kotlin 1.2.61, with support for the Kotlin-friendly Android 9 Pie SDK. Learn more. Android App Bundle - The Android App Bundle is the new app publishing format designed to help you deliver smaller APKs to your users and reduce download size of your app. Google Play's new app serving model, called Dynamic Delivery, processes your app bundle to generate and serve optimized APKs for each user's device configuration, so they download only the code and resources they need to run your app. 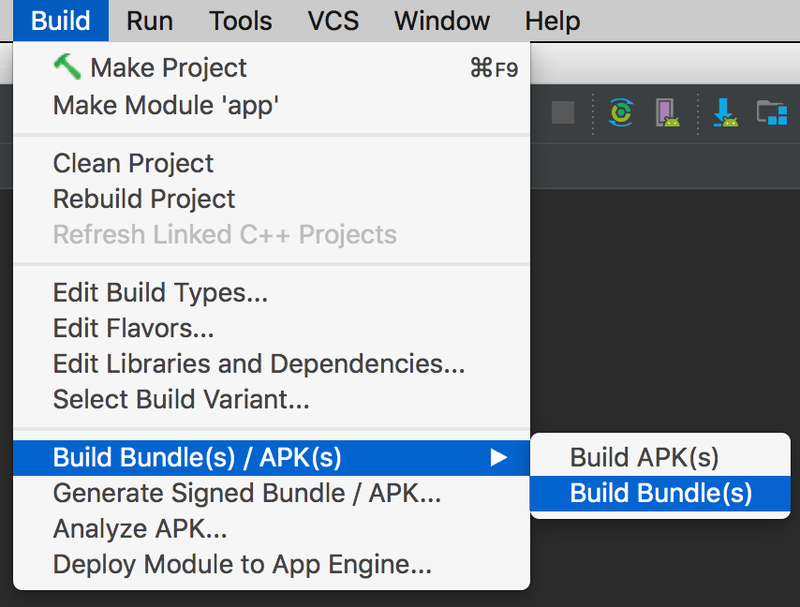 With Android Studio 3.2 or via the command line, you can easily build your code as an app bundle and get the benefit of smaller APKs based on language, screen density, and ABIs with no changes to your app code. Learn more. D8 Desugaring - In some cases, new Java Language features require new bytecodes and language APIs. However, older Android devices may not support these features. Desugaring allows you to use these features on older devices by replacing new bytecodes and language APIs with older ones during the build process. D8 desugaring is turned on by default for Android Studio 3.2 and you can now use most of the latest language changes while targeting older devices. R8 Optimizer - Starting with Android Studio 3.2, we are starting the transition to use R8 as a replacement for ProGuard to optimize and shrink Java language bytecode. R8 is still experimental, so we do not recommend publishing your app using R8 yet, but it is a good time to give the Android Studio team early feedback so we can make any adjustments before R8 fully replaces ProGuard. Learn more. Emulator Snapshots - The latest release of the Android Emulator allows you to create a snapshot of the current state of your emulator and boot up and switch into any snapshot in under 2 seconds. Built upon the Android Emulator Quickboot feature, Android Snapshots are even faster to save and load with this stable release due to under-the-hood speed enhancements. When testing and developing your app, Android snapshots allow you to pre-configure an Android Virtual Device (AVD) snapshot with the presets, apps, data and settings that you want in-place, and repeatedly go back to the same snapshot. Learn more. Microsoft® Hyper-V™ Support - You can now run the Android Emulator on Windows® 10 computers that have Hyper-V enabled. Intel HAXM is still the default hypervisor for the fastest Android Emulator experience. However,thanks to recent open source contributions by Microsoft, and the addition of the new Windows Hypervisor Platform (WHPX) API, the Android Emulator can coexist with other Hyper-V-backed applications, like local Virtual Machines, using the new Hyper-V Support. Learn more. AMD® Processor Support - AMD Processors are now supported by the Android Emulator on Windows 10. Previously running the Android Emulator was limited to slow software emulation when running Windows, but developers who have an AMD processor can now have hardware accelerated performance. Learn more. Virtual Scene Camera for Android Emulator - The new Virtual Scene camera in the Android Emulator helps you to develop for ARCore, Google's platform for building augmented reality experiences. The emulator is calibrated to work with ARCore APIs for AR apps and also allows you to inject virtual scene bitmap images. The virtual scene camera can also be used as a regular HAL3 compatible camera. Learn more. ADB Connection Assistant - Android Studio 3.2 has a new assistant system to help troubleshoot your Android ADB device connections issues. The ADB Connection Assistant walks you through common troubleshooting steps to connect your Android device to your development machine. You can trigger the assistant from the Run dialog box or by navigating to Tools → Connection Assistant . Learn more. Energy Profiler - Battery life is a key concern for many phone users, and your app may impact battery life more than you realize. The new Energy Profiler in the Android Studio performance profiler suite can help you understand the energy impact of your app on an Android device. You can now visualize the estimated energy usage of system components, plus inspect background events that may contribute to battery drain. To use the energy profiler, ensure you are connected to an Android device or emulator running Android 8.0 Oreo (API 26) or higher. Learn more. System Trace - The new System Trace feature in the CPU Profiler allows you to inspect how your app interacts with system resources in fine-grained detail. Inspect exact timings and durations of your thread states, visualize where your CPU bottlenecks are across all cores, and add custom trace events to analyze. To use system trace, start profiling your app, click into the CPU Profiler, and then choose the System Trace recording configuration. Learn more. Profiler Sessions - We now automatically save Profiler data as "sessions" to revisit and inspect later while you have Android Studio open. We've also added the ability to import and export your CPU recordings and heap dumps for later analysis or inspection with other tools. Learn more. Automatic CPU Recording - You can now automatically record CPU activity using the Debug API. After you deploy your app to a device, the profiler automatically starts recording CPU activity when your app calls startMethodTracing(String tracePath), and stops recording when your app calls stopMethodTracing(). Similarly, you can also now automatically start recording CPU activity on app start-up by enabling Start Recording a Method Trace on Startup option in your run configuration. Learn more. JNI Reference Tracking - For those of you who have C/C++ code in your Android app, Android Studio 3.2 now allows you to inspect the memory allocations of your JNI code in the Memory Profiler. 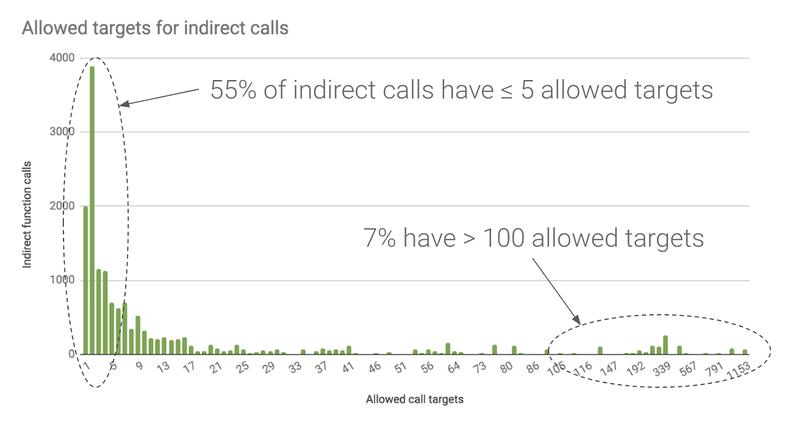 As long as you deploy your app to a device running Android 8.0 Oreo (API 26) and higher, you can drill down into the allocation call stack from your JNI reference. To use the feature, start a memory profiler session, and select the JNI Heap from the Live Allocation drop-down menu. Learn more. Check out the release notes for more details. Download the latest version of Android Studio 3.2 from the download page. If you are using a previous canary release of Android Studio, make sure you update to Android Studio Canary 14 or higher. If you want to maintain a stable version of Android Studio, you can run the stable release version and canary release versions of Android Studio at the same time. Learn more. To use the mentioned Android Emulator features make sure you are running at least Android Emulator v28.0.7+ downloaded via the Android Studio SDK Manager. We appreciate any feedback on things you like, and issues or features you would like to see. Please note, to maintain high product quality, a couple features (e.g. Navigation Editor) you saw in earlier release channels are not enabled by default in the stable release channel. If you find a bug or issue, feel free to file an issue. Connect with us -- the Android Studio development team ‐ on our Google+ page or on Twitter. At Google I/O 2018, in our What's New in Android Security session, we shared a brief update on the Android security updates program. 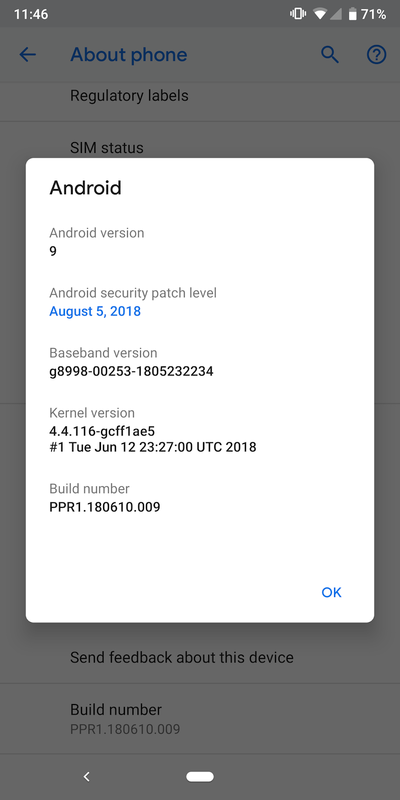 With the official release of Android 9 Pie, we wanted to share a more comprehensive update on the state of security updates, including best practice guidance for manufacturers, how we're making Android easier to update, and how we're ensuring compliance to Android security update releases. As we noted in our 2017 Android Security Year-in-Review, Android's anti-exploitation strength now leads the mobile industry and has made it exceedingly difficult and expensive to leverage operating system bugs into compromises. Nevertheless, an important defense-in-depth strategy is to ensure critical security updates are delivered in a timely manner. Monthly security updates are the recommended best practice for Android smartphones. We deliver monthly Android source code patches to smartphone manufacturers so they may incorporate those patches into firmware updates. We also deliver firmware updates over-the-air to Pixel devices on a reliable monthly cadence and offer the free use of Google's firmware over-the-air (FOTA) servers to manufacturers. Monthly security updates are also required for devices covered under the Android One program. While monthly security updates are best, at minimum, Android manufacturers should deliver regular security updates in advance of coordinated disclosure of high severity vulnerabilities, published in our Android bulletins. Since the common vulnerability disclosure window is 90 days, updates on a 90-day frequency represents a minimum security hygiene requirement. Product security factors into purchase decisions of enterprises, who often consider device security update cadence, flexibility of policy controls, and authentication features. Earlier this year, we introduced the Android Enterprise Recommended program to help businesses make these decisions. To be listed, Android devices must satisfy numerous requirements, including regular security updates: at least every 90 days, with monthly updates strongly recommended. In addition to businesses, consumers interested in understanding security update practices and commitment may also refer to the Enterprise Recommended list. We've also been working to make Android easier to update, overall. A key pillar of that strategy is to improve modularity and clarity of interfaces, enabling operating system subsystems to be updated without adversely impacting others. Project Treble is one example of this strategy in action and has enabled devices to update to Android P more easily and efficiently than was possible in previous releases. The modularity strategy applies equally well for security updates, as a framework security update can be performed independently of device specific components. Another part of the strategy involves the extraction of operating system services into user-mode applications that can be updated independently, and sometimes more rapidly, than the base operating system. For example, Google Play services, including secure networking components, and the Chrome browser can be updated individually, just like other Google Play apps. Partner programs are a third key pillar of the updateability strategy. One example is the GMS Express program, in which Google is working closely with system-on-chip (SoC) suppliers to provide monthly pre-integrated and pre-tested Android security updates for SoC reference designs, reducing cost and time to market for delivering them to users. Recently, researchers reported a handful of missing security bug fixes across some Android devices. Initial reports had several inaccuracies, which have since been corrected. We have been developing security update testing systems that are now making compliance failures less likely to occur. In particular, we recently delivered a new testing infrastructure that enables manufacturers to develop and deploy automated tests across lower levels of the firmware stack that were previously relegated to manual testing. In addition, the Android build approval process now includes scanning of device images for specific patterns, reducing the risk of omission. In 2017, about a billion Android devices received security updates, representing approximately 30% growth over the preceding year. We continue to work hard devising thoughtful strategies to make Android easier to update by introducing improved processes and programs for the ecosystem. In addition, we are also working to drive increased and more expedient partner adoption of our security update and compliance requirements. As a result, over coming quarters, we expect the largest ever growth in the number of Android devices receiving regular security updates. Bugs are inevitable in all complex software systems, but exploitability of those bugs is not. We're working hard to ensure that the incidence of potentially harmful exploitation of bugs continues to decline, such that the frequency for security updates will reduce, not increase, over time. While monthly security updates represents today's best practice, we see a future in which security updates becomes easier and rarer, while maintaining the same goal to protect all users across all devices. All TVs have the same problem with keyboard input: It is very cumbersome to hunt and peck for each letter using a D-pad with a remote. And if you make a mistake, trying to correct it compounds the problem. APIs like Smart Lock and Autofill, can ease user's frustrations, but for certain types of input, like login, you need to collect complex input that is difficult for users using the on-screen keyboard. With the Nearby Connections API, you can use a second screen to gather input from the user with less friction. "Nearby Connections is an offline peer-to-peer socket model for communication based on advertising and discovering devices in proximity. Usage of the API falls into two phases: pre-connection, and post-connection. In the pre-connection phase, Advertisers advertise themselves, while Discoverers discover nearby Advertisers and send connection requests. A connection request from a Discoverer to an Advertiser initiates a symmetric authentication flow that results in both sides independently accepting (or rejecting) the connection request. After a connection request is accepted by both sides, the connection is established and the devices enter the post-connection phase, during which both sides can exchange data." In most cases the TV is the advertiser and the phone is the discoverer. In the example below, the assumed second device is a phone. The API and patterns described in this article are not limited to a phone. For example, a tablet could also be the second screen device. There are many times when keyboard input is required. Authenticating users and collecting billing information (like zip codes and name on card) are common cases. This example handles a login flow that uses a second screen to see how Nearby Connections can help reduce friction. 1. The user opens your app on her TV and needs to login. You can show a screen of options similar to the setup flow for a new TV. 2. 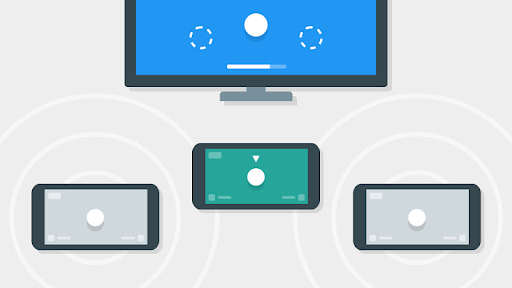 After the user chooses to login with their phone, the TV should start advertising and send the user to the associated login app on their phone, which should start discovering. There are a variety of solutions to open the app on the phone. 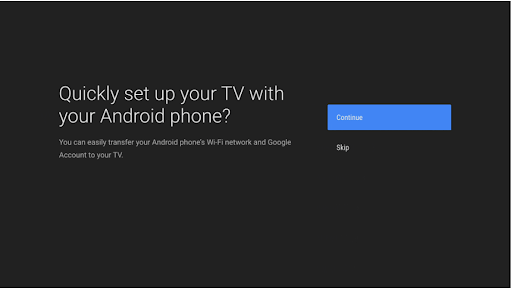 As an example, Android TV's setup flow has the user open the corresponding app on their mobile device. Initiating the hand-off is a more a UX concern than a technology concern. 3. The phone app should display the advertising TV and prompt the user to initiate the connection. After the (encrypted -- see Security Considerations below for more on this) connection is established the TV can stop advertising and the phone can stop discovering. "Advertising/Discovery using Nearby Connections for hours on end can affect a device's battery. While this is not usually an issue for a plugged-in TV, it can be for mobile devices, so be conscious about stopping advertising and discovery once they're no longer needed." 4. Next, the phone can start collecting the user's input. Once the user enters their login information, the phone should send it to the TV in a BYTES payload over the secure connection. 5. When the TV receives the message it should send an ACK (using a BYTES payload) back to the phone to confirm delivery. 6. When the phone receives the ACK, it can safely close the connection. Nearby Connections needs location permissions to be able to discover nearby devices. Be transparent with your users. Tell them why they need to grant the location permission on their phone. Since the TV is advertising, it does not need location permissions. After the user chooses to login on the phone, the TV should start advertising. This is a very simple process with the Nearby API. When the user clicks a button, update the UI to tell them to look at their phone to continue. Be sure to offer a way to cancel the remote login and try manually with the cumbersome onscreen keyboard. This example uses a GuidedStepFragment but the same UX pattern applies to whatever design you choose. Advertising is straightforward. You need to supply a name, a service id (typically the package name), and a `ConnectionLifeCycleCallback`. You also need to choose a strategy that both the TV and the phone use. Since it is possible that the users has multiple TVs (living room, bedroom, etc) the best strategy to use is P2P_CLUSTER. Then start advertising. The onSuccessListener and onFailureListener tell you whether or not the device was able to start advertising, they do not indicate a device has been discovered. The real magic happens in the `connectionLifecycleCallback` that is triggered when devices start to initiate a connection. The TV should accept the handshake from the phone (after performing the necessary authentication -- see Security Considerations below for more) and supply a payload listener. The payloadCallback listens for the phone to send the login information needed. After receiving the login information, the connection is no longer needed. We go into more detail later in the Ending the Conversation section. After opening the app on the phone, start by prompting the user for location permission if not already granted on devices running Marshmallow and higher. Once the permission is granted, start discovering, confirm the connection, collect the credentials, and send a message to the TV app. Discovering is as simple as advertising. You need a service id (typically the package name -- this should be the same on the Discoverer and Advertiser for them to see each other), a name, and a `EndpointDiscoveryCallback`. Similar to the TV code, the flow is triggered by callbacks based on the connection status. // We were unable to start discovering. The Discoverer's listeners are similar to the Advertiser's success and failure listeners; they signal if the request to start discovery was successful or not. Once you discover an advertiser, the `EndpointDiscoveryCallback` is triggered. You need to keep track of the other endpoint to know who to send the payload, e.g. : the user's credentials, to later. // An endpoint was found! // A previously discovered endpoint has gone away. One of the devices must initiate the connection. 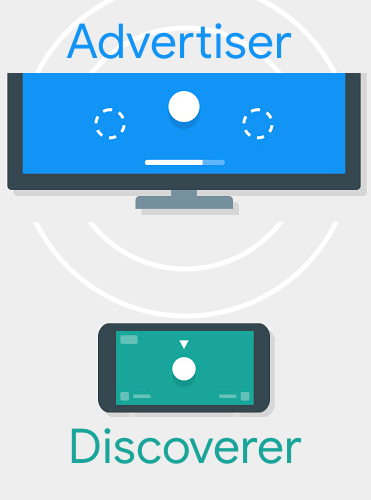 Since the Discoverer has a callback for endpoint discovery, it makes sense for the phone to request the connection to the TV. The phone asks for a connection supplying a `connectionLifecycleCallback` which is symmetric to the callback in the TV code. Once the connection is established, stop discovery to avoid keeping this battery-intensive operation running longer than needed. The example stops discovery after the connection is established, but it is possible for a user to leave the activity before that happens. Be sure to stop the discovery/advertising in onStop() on both the TV and phone. Just like a TV app, when you accept the connection you supply a payload callback. The callback listens for messages from the TV app such as the ACK described above to clean up the connection. 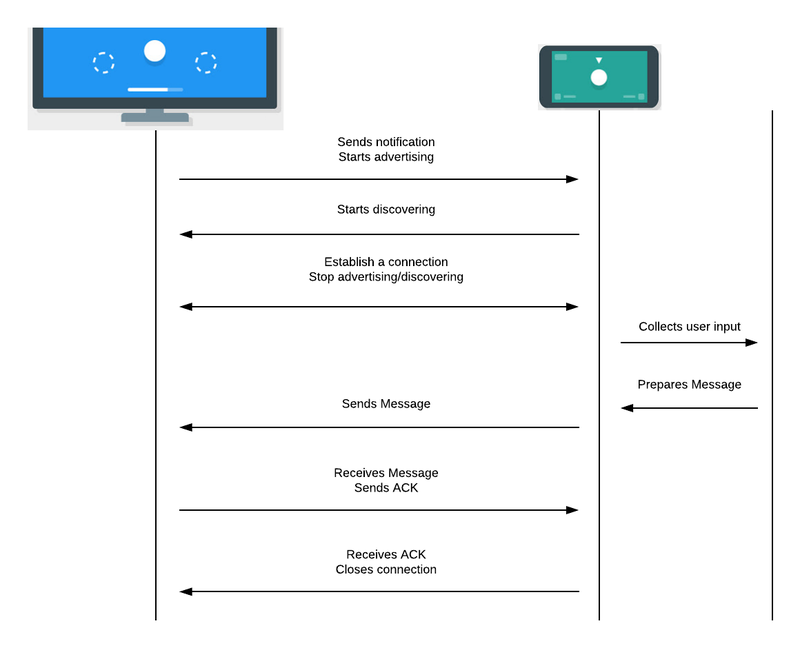 After the devices are connected, the user can use the keyboard and send their authentication information to the TV by calling `sendPayload()`. After the phone sends the payload to the TV (and the login is successful), there is no reason for the devices to remain connected. The TV can initiate the disconnection with a simple shutdown protocol. The TV should send an ACK to the phone after it receives the credential payload. // Validate that this payload contains the login credentials, and process them. The phone should have a `PayloadCallback` that initiates a disconnection in response to the ACK. This is also a good time to reset the UI to show an authenticated state. For security (especially since we're sending over sensitive information like login credentials), it's strongly recommended that you authenticate the connection by showing a code and having the user confirm that the two devices being connected are the intended ones -- without this, the connection established by Nearby Connection is encrypted but not authenticated, and that's susceptible to Man-In-The-Middle attacks. The documentation goes into greater detail on how to authenticate a connection. Does your app offer a second screen experience? There are many times when a user needs to supply input to a TV app. The Nearby API provides a way to offload the hardships of an onscreen-dpad-driven keyboard to an easy and familiar phone keyboard. What use cases do you have where a second screen would simplify your user's life? Leave a comment or send me (@benjamintravels) or Varun (@varunkapoor, Team Lead for Nearby Connections) a tweet to continue the discussion. According to the World Health Organization1, around 466 million people worldwide have disabling hearing loss. This number is expected to increase to 900 million people by the year 2050. Google is working with GN Hearing to create a new open specification for hearing aid streaming support on future versions of Android. Users with hearing loss will be able to connect, pair, and monitor their hearing aids so they can hear their phones loudly and clearly. Hearing aid users expect a high quality, low latency experience with minimal impact on phone and hearing aid battery life. We've published a new hearing aid spec for Android smartphones: Audio Streaming for Hearing Aids (ASHA) on Bluetooth Low Energy Connection-Oriented Channels. ASHA is designed to have a minimal impact on battery life with low-latency while maintaining a high quality audio experience for users who rely on hearing aids. We look forward to continually evolving the spec to even better meet the needs of our users. The spec details the pairing and connectivity, network topology, system architecture, and system requirements for implementing hearing aids using low energy connection-oriented channels. Any hearing aid manufacturer can now build native hearing aid support for Android. The protocol specification is available here. Existing Wear apps: 4 March 2019. The review process for mobile apps remains unchanged, and is independent of the Wear app review. Mobile app updates will not be blocked if they fail the Wear app review. We hope this lightweight app review process will improve the quality of Wear app experiences across the wide range of devices available to your users. In addition, since screenshots are required for the Wear app review, this will improve the discovery and presentation of your Wear apps in the Google Play Store. 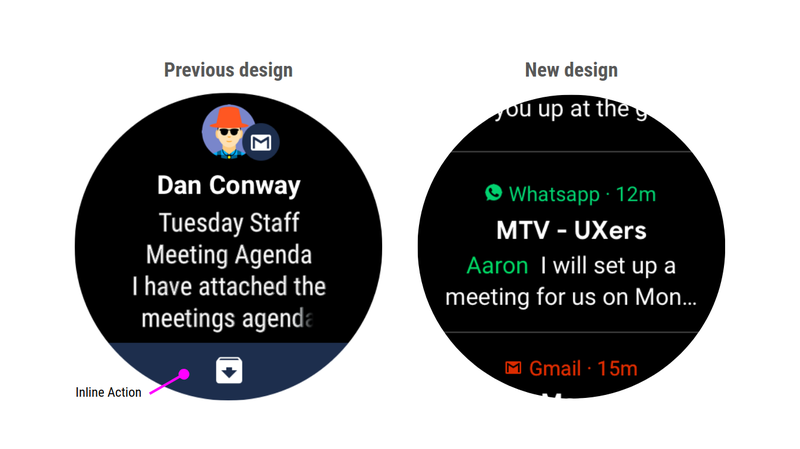 Support for different screen types - Wear OS by Google is available in both round and square screens, and some round devices also have a chin. Developers are advised to test on all screen types. If a physical device is unavailable, please use the Wear OS by Google emulator. 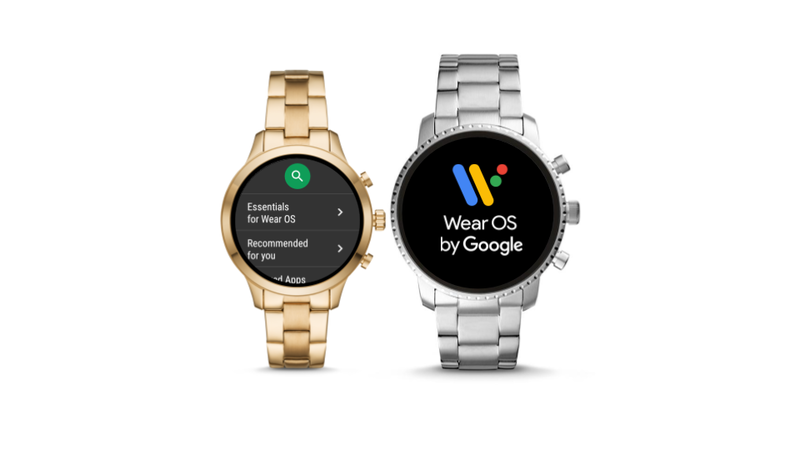 Wear OS by Google app screenshot - To pass the review, the app needs to have at least one Wear OS app screenshot. To keep pre-release Wear apps private, the Google Play Store will not show the Wear screenshots unless the Wear App is in production or open testing. Currently, the Google Play Store only supports uploading one set of screenshots across all production and test versions. For existing Wear apps, we recommend developers keeping their production Wear app screenshots unchanged when uploading new open test or closed test Wear apps. Leverage internal testing features via the Google Play console, which enables developers to test with up to 100 internal testing accounts. Please note that the open test and closed test channels will be subject to Wear app review to help front-load the quality assurance process and to avoid leaving reviews to the last minute. Thank you for your continuing support of Wear OS by Google. Shrinking download size: Android App Bundle & Dynamic Delivery has helped reduce app sizes by up to 65%, leading to increased downloads and fewer uninstalls. Helping improve quality: New tools in the Play Console have helped you reduce crash rates by up to 70%. Improving discovery: Improvements to the discovery experience have increased Google Play Store visits by 30% over the last 12 months. Keeping users safe: Google Play Protect scans more than 50 billion apps a day and Android API level 26 adoption requirements improve app security and performance. We've added more testing tools to the popular Play Console to help developers de-risk app launches with internal and external test tracks and staged rollouts to get valuable early feedback. This year we've expanded the Start on Android program globally that provides developers new to Android additional guidance to optimize their apps before launch. Google Play Instant remains a huge bet to transform app discovery and improve conversions by letting users engage without the friction of installing. We're seeing great results from early adopters and are working on new places to surface instant experience, including ads, and making them easier to build throughout the year. Google Play plays an important role helping developers understand and fix quality and performance issues. At I/O, we showcased how we expanded the battery, stability and rendering of Android vitals reporting to include app start time & permission denials, enabling developers to cut application not responding errors by up to 95%. We also expanded the functionality of automated device testing with the pre-launch report to enable games testing. Recently, we increased the importance of app quality in our search and discovery recommendations that has resulted in higher engagement and satisfaction with downloaded games. 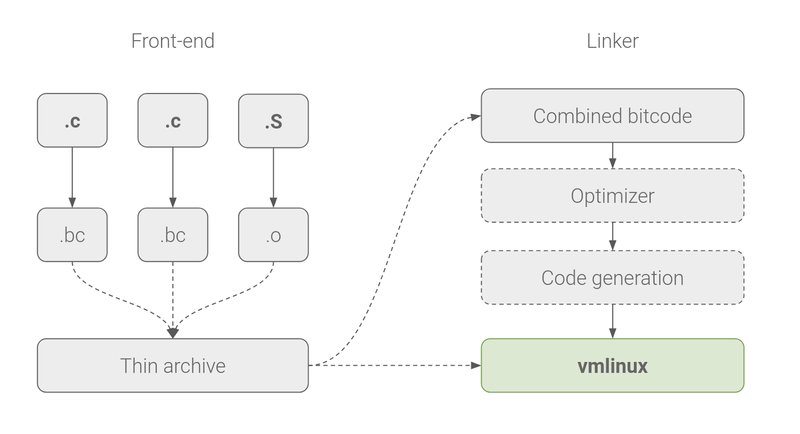 Over the last year we've rolled out more editorial content and improved our machine learning to deliver personalized recommendations for apps and games that engage users. Since most game downloads come from browsing (as opposed to searching or deep linking into) the store, we've put particular focus on games discovery, with a new games home page, special sections for premium and new games, immersive video trailers and screenshots, and the ability to try games instantly. We've also introduced new programs to help drive app downloads through richer discovery. For example, since launching our app pre-registration program in 2016, we've seen nearly 250 million app pre-registrations. Going forward, we'll be expanding on these programs and others like LiveOps cards to help developers engage more deeply with their audience. Google Play now collects payments in 150 markets via credit card, direct carrier billing (DCB), Paypal, and gift cards. Direct carrier billing is now enabled across 167 carriers in 64 markets. In 2018, we have focused on expanding our footprint in Africa and Latam with launches in Ghana, Kenya, Tanzania, Nigeria, Peru & Colombia. And users can now buy Google Play credit via gift cards or other means in more 800,000 retail locations around the world. This year, we also launched seller support in 18 new markets bringing the total markets with seller support to 98. Our subscription offering continues to improve with ML-powered fraud detection and even more control for subscribers and developers. Google Play's risk modeling automatically helps detect fraudulent transactions and purchase APIs help you better analyze your refund data to identify suspicious activity. Google Play Protect and our other systems scan and analyze more than 50 billion apps a day to keep our ecosystem safe for users and developers. In fact, people who only download apps from Google Play are nine times less likely to download a potentially harmful app than those who download from other sources. We've made significant improvements in our ability to detect abuse—such as impersonation, inappropriate content, fraud, or malware—through new machine learning models and techniques. The result is that 99% of apps with abusive content are identified and rejected before anyone can install them. We're also continuing to run the Google Play Security Rewards Program through a collaboration with Hacker One to discover other vulnerabilities. We are continually inspired by what developers build—check out #IMakeApps for incredible examples—and want every developer to have the tools needed to succeed. We can't wait to see what you do next! There are millions of apps in the Android ecosystem, so helping yours get discovered can require some investment. Your app needs to offer something that differentiates it from other similar apps to stand out to users. Building a companion Action is a fast and simple way to increase your Android app's potential reach by creating a new entrypoint from devices covered by the Google Assistant. This lets you bring your services to users without needing to install anything through voice, and can bring people into your app when it can provide more value. Your companion Action complements your Android app's experience by offering some of your services through the Google Assistant, which is available on more than 500 million devices including speakers, phones, cars, headphones, and more. Creating an Action provides a frictionless way for users to start engaging with your services wherever the Google Assistant is available. Creating an Action for the Assistant will extend your brand presence, bringing your services to new devices and contexts as users interact with the Google Assistant. It is probably a mistake to try to rewrite all of your Android app as a conversational Action, since voice is a different modality with different constraints and usage patterns. Instead, you should start by selecting the most important or popular features in your app that translate well into a voice context and can be more easily accomplished there. Then, you can create your conversational experience to offer these features on Google Assistant devices. Check out the Conversation design site, which has several articles and guides about how to create a great voice UI. Let's take a look at a hypothetical example. Imagine you have a mobile commerce app. Some features include searching for products, navigating to different categories, adding payment information, and checking out. You could build an Action for the Assistant with most of the same functionality, but we encourage you to look for what makes the most sense in a conversational experience. In this case, your Action could focus on everything that a user would want to know after they've purchased a product through your Android app or web page. You could offer a quick way to get updates about a purchase's status (if you provide different states for payment/purchase process) and shipment information, or provide an interface for re-ordering a user's favorite products. Then, your users would be able to ask something like, "Hey Google, ask Voice Store about my last purchase." Or, to reach users who have never made a purchase before, you could create an Action to offer exciting deals for common products. For example, you could create an Action that is invoked with, "Hey Google, ask Voice Store what are the deals on TVs today". As you can see, starting with a "hero" use case for your Action is an exciting way to introduce conversational features that complement your Android app, and it will take less time than you think. At Google I/O 2018, we presented a talk, "Integrating your Android apps with the Google Assistant" which contains more details and examples for developers. In-app purchases, subscriptions, and one-time products have proven successful for Android developers when it comes to monetization, allowing developers to offer different kinds of digital goods and additional value for paying users. These types of monetization are proven to drive user conversion and make the app more profitable. Google Play Billing offers a series of tools, APIs, and documentation to help developers manage the subscription life-cycle, build server-side validation, and much more. If you are new to in-app billing, check out the Google Play Billing Overview page. Now, Android developers can expand where users can access these goods or upgraded experiences by offering them through Actions, as well. This expansion is accomplished by honoring the user's entitlements on Google Play across different surfaces and devices, reaching users when they can't (or don't want to) use an app, like while cooking or driving. For non-Android platforms, you'll need to ask your users to link their accounts. You can then use your user's account history to identify what purchases they've made on other surfaces. Check the Accessing Digital Purchases page for a step-by-step guide on how to enable access to the user's purchases and request and parse the purchase data. 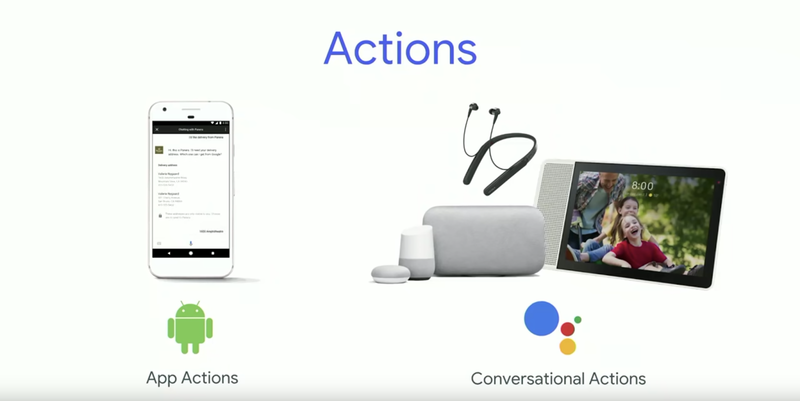 If you are not familiar with Actions on Google yet, start by checking out our overview page, which describes the platform in detail and tells you all you need to know to create your Actions for the Google Assistant. Stay tuned for more posts about how to improve your Android app experience with Actions on Google.